The larks head knot (LH) is a really easy method for attaching your cords to a clasp, jump ring, or other finding at the beginning of a knotted jewelry project. Fold your length of hemp twine or other cord in half at the center. 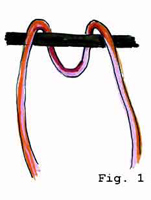 Take the fold and slide it over the dowelling and pull it down a bit so that you can see the loop below the dowelling as in Fig. 1. 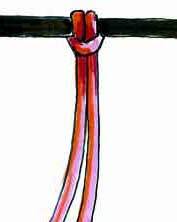 To attach one half of a clasp, you follow the exact same method as described above, except instead of folding the cord over a dowel, you slip the end through the hole of the clasp. Find the centre of your cord or twine and fold in half as in step 1 above. Take the fold and string it through the hold of the clasp an inch or so. You will have a loop similar to Fig. 2 above. Take the two ends of the cord or twine and slip them through the loop. Note: You can use a lark's head knot to attach a clasp at the start of a project only. To attach the other end of the clasp you'll need to choose a different attachment method.